Elliot asked me to talk about community. I gave it a lot of thought. What is a community? When I look around, I see a mix of friendly faces, many smiling, listening, open to what I am about to say. I know there are many divergent backgrounds here, different points of view, different life stories. It seems possible that some of us under other circumstances might never meet. But the separation that often follows differences doesn't seem to matter here, despite a wide range of divergence this is unquestionably a community. A friendliness and a sense of caring flow through like a gentle river. So, what is this ingredient, this wine, that we all seem to be drinking from… what then brings us together and keeps us together? And on a personal level, for me, why I am here, what brought me here? Why do I keep coming back? Why do you keep coming back? A church is building and more than a building. People are the church. People have healing power. And for me, you, the Church, the people, by allowing me into your community have helped me heal from an ancient wound. When we experience something sometimes, we understand that experience only much later You and my participation in this community have enabled me to understand the church of my childhood, the church that I left, in a deeper more compassionate way. I would like to tell you about that-- So this is in part personal testimony. As a lifelong private introvert, I hesitated. It’s a refugee story and a prodigal daughter story. It seems too much like all about me. But when I remember the millions of refugees in the world today it seems it is about them as well as about me. I was raised in a religious family. Strict Calvinists, we prayed at all meals at rising and before sleeping. We honored the Sabbath. Go to church twice each Sunday. Read bible at each meal. I was baptized. Calvinist Doctrine is very dualistic. The first tenant of Calvinism is total depravity. In the Calvinist tradition baptism means that from that moment on, although remaining completely depraved you become one of the elect, that is saved by grace. Those not so elected are destined to the eternaldamnation that we all deserve because of our profound sinfulness. Now let me circle back very briefly to my early life and its consequences. I was born in 1941 in the war, in Holland. Very close to Rotterdam. MY first four years are It was everything you might imagine. Bombs, land mines, occupation, evacuation, concentration camps, Nazis, the underground, starvation. Soldiers, bodies, fear, danger, hunger, death. Along with 2 million other Europeans, my family left Europe after the war. We become known as the new lost generation. At age 8 I arrive in Canada and not Brazil, South Africa or New Zealand where other villagers end up. Learn English quickly. Change my name to Elaine. Being white skinned I soon pass. I live in two worlds. My mother, invalid, speak only Dutch. Family life and my inner life is deeply marinated in Calvinist doctrine. The church is a closed community. Ecumenicity is a threat, and we live in the midst of Christian heathens and Catholic Papists. As a teenager, I may date and befriend anyone in the church. Canadian heathens are categorically off limits. It seems extreme now, and I rebelled against it then. But I studied immigrant families for my dissertation and am no longer so judgmental. With increased understanding, I am now more able to walk in the adult shoes of parents. Displaced refugees have no reason to be confident that they or their families will survive or thrive. For them church and religion offer a safety net, a single hope of re-establishing community where closely held essential values may be safeguarded. In the middle of a sea of change and uncertainty churches are containers of stability and easily become dogmatic closed systems. In my late teens, I become prodigal. By this time I have a big problem. As a youngster, I was a true believer with a natural, sincere questioning mind. I loved the simplicity of the parables did my very best to be as Jesus would want me to be. But there are troubling Contradictions. I read Cry the Beloved Country. My church runs apartheid in South Africa. The explanation of Noah and his three sons doesn’t do it for me. I hear racism, To my young mind, Calvinist Imperialism patriarchal privileges, the subservient role of women, the exclusion of Catholics and denigration of “homosexuals” contradict my understanding of the parables I am headstrong. A seed of resistance grows, and while I could not articulate it very well, I was no longer a true believer. I was in serious conflict. At 18 family finances don’t require my presence in the family labor force and I am the first and only one to receive the privilege of a college education. McMaster University is where I live, but it is Canadian. Calvin College in Michigan is the answer. I go to Calvin, meet and marry an American, followed him to graduate school. The last coffin in my Calvinist identify comes when I teach Sunday school in a Presbyterian church and ask the Canadian church to transfer my church membership. The request is refused. Calvin and I part ways. It is another huge loss in my, and the Losses are piling up. With nowhere to go, I took a nose dive in an existential vacuum. I am with Sartre in no exit, become Camus stranger, T.S Eliot’s wasteland. I am in Existential crisis. But just as I was about to go under there is a net—in following my husband graduate school I find myself no longer in Michigan. Finishing my B.A. A philosophy major I enroll in a philosophy of religion class. The professor is a minister. The class is small. He listens. In the class, I am introduced to others who have been changed by the war: Paul Tillich, Buber, Niebuhr, Bonhoeffer, Kierkegaard. He also opens the East: The Toa, The Dhammapada, mystics. I begin to breathe again. A whole new world opens. I begin to find new ground. My heart lightens, A new shoot emerges from the wasteland. So fast forward 30 or 40 years. In time I divorce, become a clinical psychologist. In my family of origin contradictions and paradox continue. My family continues to fear for my soul. In my clinical practice, I have a reputation for spirituality. 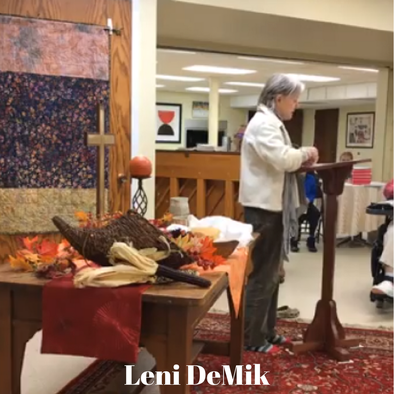 My caseload is heavy with nuns and clergy, invited to give talks on spiritual bypassing in spiritual direction programs I openly identify myself as Buddhist serve on the board of the Franciscan center as well as the Minnesota Zen Meditation center. I walk in several worlds. This is finally, where you all come in. In the 21st century, I start to walk daily with Molly Falk. She is a bit astonished by my story, says with certainty that not all churches are like that. Now I might have taken that with a grain of salt but Molly was in the peace corps, she is not a flake, and I respect her. While she invites “you should come to my church!” she shows no sign of wanting to convert me. I privately wonder if her church is really Christian. Somewhere Molly asks if I might have work for someone called Shibo a young man from the Sudan whose family has been sponsored by Molly’s church. Through my connection with Shibo I connect with Elliot. Although he is minister Elliot seems a little odd, You would not know that he is a minister. he talks like a normal person. Sometime later Clarence asks if I would give a talk on depression at church. Later Elliot, the Falks and I meet again when Shibo runs into some snags at college. Somewhere I become transparent and let the cat out of the bag. I tell Elliot that I am Buddhist. He says “Oh, and expresses an interest in mediation. I tell him that I have received training to lead meditation . A few months later he calls to ask if I would consider leading meditation with a Lutheran minister, Emily Meyer. I think he must not have heard the Buddhist part. Buddhism has no interest in conversion, but he might not know that and if he knew he might not want his congregation to be exposed to that. Maybe to imprint that I am Buddhist, I tell him I have spent 30 days with the Dalai Lama, consider him to be one of my teachers. Elliot doesn't seem to care. Emily and I begin. What sort of unglues me is that Elliot and Jan attend—It makes no sense to me. I keep waiting for the day he will wake up and realize that he has invited a wolf into the flock. Somewhere I start to come to church. It turns out I still know many of the hymns by heart— and of course, I know the Bible well. It feels good here. I hug people they hug back. People hug each other.There are amazing people like Norma, Lawrence, Pete, Tiffany, Connie. Steve, Sue, Mary No one asks me to defend what I believe. I expect them to challenge my presence in the church if I am a Buddhist heathen. I keep waiting for the shoe to drop, to be found out and confronted. It does not happen. In that space, something begins to fall into place. This church is not the church of traumatized immigrants trying to find their way in an impossibly difficult moment in time. I left that church when It was in a time of chaos. It opens the wound, and I feel sad, to see it from this view but something is moving in me, and I am healing. I feel still new here, and I don’t know you all. But I have a sense of who you are from how I feel when I am with you. I feel the river of kindness, authenticity, and openness. I see our differences and our sameness, marvel at how with all our differences are nevertheless knitting together into a tapestry, creating a community story, becoming brothers and sisters. I want to end this overly long talk with thanks. To those who were here holding the space when I arrived, thank you for opening the door, for making space, including me in the co-creation of the church family. I believe community is medicine. For its members, Community provides ground, a container, opportunity for community members to experience the safety of belonging. In the assurance of belonging and being cared for healing and growth happen naturally. We do better when we are whole when we partake in the joy of connectedness. Our wounds take up energy. Healing releases that resistance frees it to flow into the world, to service to become the change that we long for. Being with you has helped me heal, opened me to finding new compassion not only for myself but also for the beleaguered church community that I left. This church is teaching me that where there is a balance, where a strong foundation exists, change and difference need not be a threat. The teachings of Jesus and Buddha are free of dogma. Simple enough for children. Be kind, humble, care for each other, refrain from what is harmful, respect, cultivate wisdom and discernment. Risk, take a long shot, Make the effort, sacrifice for what matters. And above all, love. I experience all of that here!